Buena Vista is Spanish for “good view,” which is exactly what you’re going to get on this easy 2 mile out-and-back hike in Kings Canyon National Park. This is one of the easiest peaks you can bag, and it may seem like you’re cheating a little bit considering the astounding views down Redwood Canyon, over the Kings Canyon high country, and back over the Great Western Divide. However, the ease of this hike makes it an excellent sunset/picnic/bottle of wine-with-your-loved-one affair. The peak is a minor exfoliation dome formed by a granite mass (known as a pluton) that has pushed its way through to the surface over millions of years. As the dome became exposed, it also became subject to various weathering forces. These domes get the name “exfoliation” because concentric layers of granite will slough off as ice wedging splits the rocks apart at their cracks and faults. You can see the resulting layers present in the boulders, which have all been slowly pushed apart by ice over eons of cold winters. 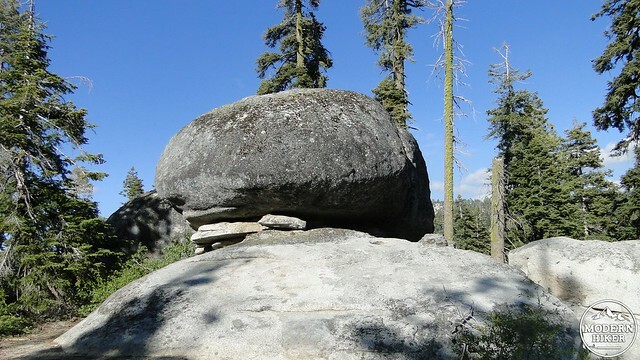 Many of the domes and granite outcrops in the Sierra are subject to this process. 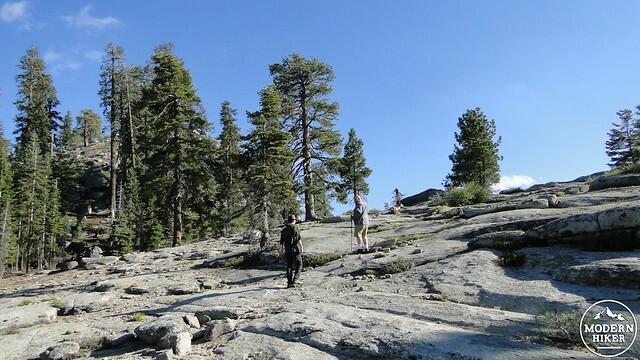 The trail starts from a turnout along Generals Highway almost directly across from the Kings Canyon viewpoint. 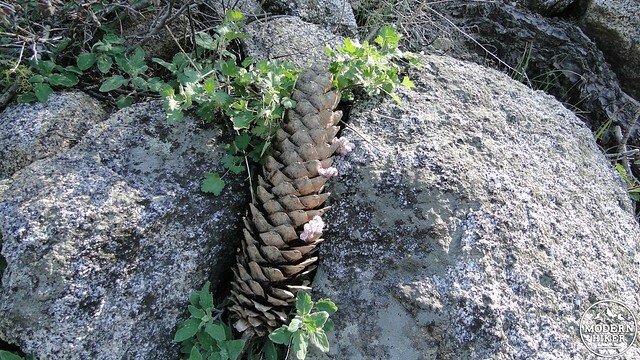 Follow the track up a gentle hill through mixed-conifer forest and several precariously stacked piles of boulders. Before the trail reaches the rim of Redwood Canyon directly ahead, it will bend to the right and begin a gentle ascent through forest and then a large field of granite slabs where the trail is occasionally marked by cairns (also called ducks by some). After the slabs, the trail will plunge back into the forest again as it continues to climb obliquely along the east and northeast side of the peak. After a brief set of switchbacks, from which you can spot the dog-shaped rock pile, the trail will come to another clearing where the trail will make a 180 degree turn to the right to reach the peak. This is the only confusing spot on the trail; everything after this point is pretty rocky and the trail can sometimes blend into granite slabs. This makes picking up the trail on the return trip a bit of a challenge. I’ve found it helpful in the past to hang a bandana or article of spare clothing from a small fir tree marking the junction so that I have something to look for on the way down, particularly if I’m taking a sunset hike. After the bend to the right, the trail will climb just east of the rim of Redwood Canyon. You’ll see some marvelously contorted and picturesque Jeffrey pines in this section mixed in with the boulders. Jeffreys prefer drier slopes and are often at home on rocky outcrops. 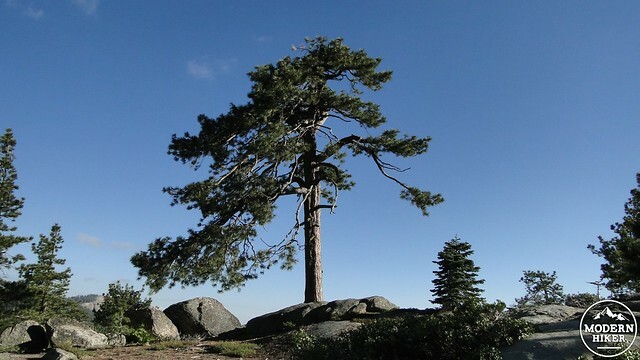 The trail will climb through a brief patch of forest before the final approach to the peak over granite slabs and into a circle of weathered boulders. This flat section surrounded by boulders marks the broad summit, but the higher points from which to view the canyon and the Kings Canyon high country to the east are just to the left of this flat, sandy spot. This flat spot looks like it would make for an excellent campsite, but be warned that, sadly, no dispersed camping is allowed on Buena Vista Peak. 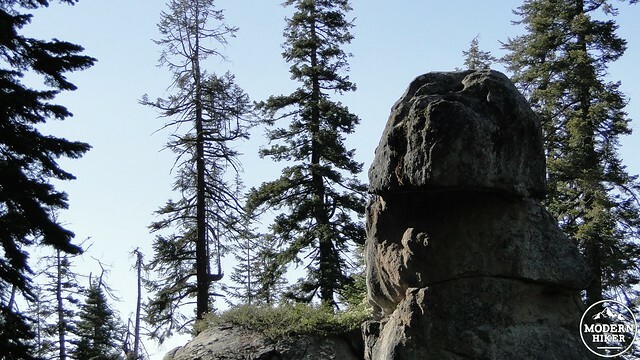 You’ll see several boulders that seem to be inviting you to climb up or scramble over. These will all make nice spots for hunkering down and taking in the view. 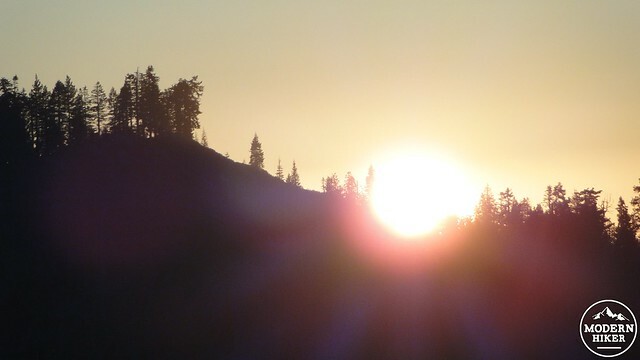 This is a great spot for sunset viewing, particularly toward August and September, when the sun sinks a little further to the south between Redwood Mountain and the Grants Grove ridge. Below you is Redwood Canyon, which holds the world’s largest sequoia grove. Redwood Mountain rises up on the opposite side of the canyon, and it is easy to pick out the rounded shapes of sequoia crowns rising up over the ridge. 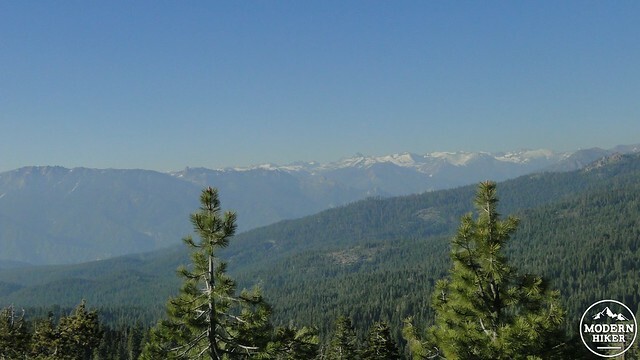 To the east, you will see the Kings Canyon high country, although Kings Canyon itself is obscured due to its great depth and east-west orientation. However, you’ll still be able to gaze upon the Monarch Divide, and you might be able to spot Tehipite Dome if it’s clear enough. Looking south, you’ll also be able to pick out some of the peaks above Kaweah Canyon, including a portion of the Great Western Divide. Once you’ve enjoyed the excellent views, you will head back down the peak. This is a bit of a challenge for the return, as their are a couple of paths leading down the peak, which can cause some disorientation for the return trip. If you are not following the GPS rack, return down any promising path while keeping the rim of Redwood Canyon to your right. If you’ve left an article of clothing dangling from a tree near the 180 turn in the trail, keep your eyes peeled for that even if the path seems different from the one you came up on. Once you’ve found this spot and resumed the proper trail, it’s a simple matter of retracing your steps back to your car. 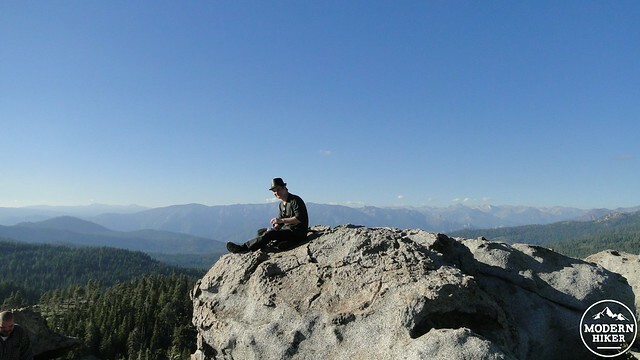 – There is a $20 entrance fee for Kings Canyon/Sequoia National Parks, which are jointly operated and for which one fee covers both. If you’re a frequent flyer at the National Parks, it would be wise to get an Annual Pass for $80, which allows unlimited access at parks and monuments for one calendar year. – The photos in this write-up were taken in June of 2011, August of 2011, and July of 2013. The closest and most pleasant campground is about 5-6 miles south at Stony Creek Recreation Area. Either Upper Stony Creek or Lower Stony Creek will be great for camping, although Upper Stony Creek is prettier and more spread-out of the two. Campgrounds are closed between Labor Day (ish) and Memorial Day (ish). From Visalia, take Highway 198 east through town, through Lemon Cove, and through Three Rivers to the Ash Mountain entrance at Sequoia National Park. Follow Generals Highway up the mountain, through Giant Forest and Lodgepole, past Dorst Creek, and finally past Stony Creek Recreation Area. The dirt parking lot for the peak will be past the Big Baldy Trailhead and just opposite the Kings Canyon viewpoint on the east side of the road. Yes - it's a Wordpress plugin that renders all that data and puts it on a map for you. If you wanted to get your own elevation profile, CalTopo is wonderful for planning and dreaming and will also let you import a GPX or KML/KMZ file if you have it. Or there are tons of smartphone and desktop apps that will get it done for you, too. That’s a Casey question. I think it’s a wordpress plugin that extrapolates the GPS data, but he can give you a better answer. You can make your own elevation profiles by plugging the GPS track into Caltopo. How do you make your elevation plots?